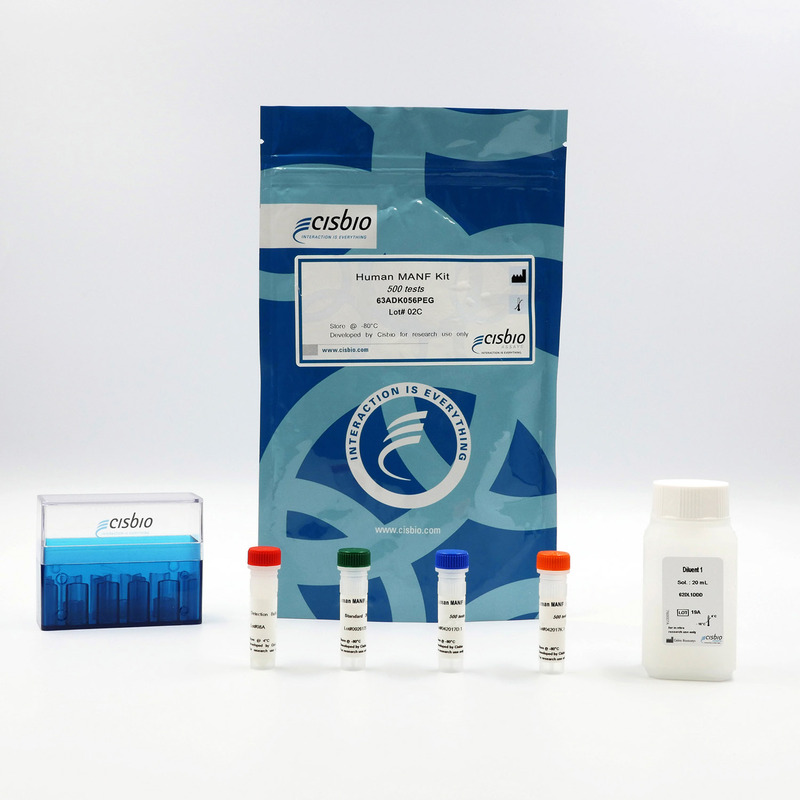 The human MANF kit is designed for the rapid quantification of Mesencephalic Astrocyte-derived Neutrophic Factor in cell supernatants and serum. Mesencephalic astrocyte-derived neurotrophic factor (MANF) (also recognized as ARMET or arginine-rich mutated in early stages of tumors) belongs to the fourth family of neurotrophic factors. MANF is an endoplasmic reticulum (ER) resident protein highly expressed in the developing cortex that plays an important role in protecting and repairing dopaminergic neurons in the rat 6-hydroxydopamine Parkinson disease model. MANF is also involved in protecting against various forms of endoplasmic reticulum stress. The human MANF kit enables the fast detection of MANF in cell supernatants and serum. Human MANF is measured using a sandwich immunoassay involving two specific human MANF antibodies, respectively labelled with Europium Cryptate (donor) and d2 (acceptor). The intensity of the signal is proportional to the concentration of MANF present in the sample. The MANF assay features a streamlined protocol with only one incubation step following the sample/calibrator and Antibody conjugates dispensing. The antibodies labelled with HTRF donor and acceptor may be pre-mixed and added in a single dispensing step to further streamline the assay procedure. This protocol requires a single 4-hour incubation period at RT.